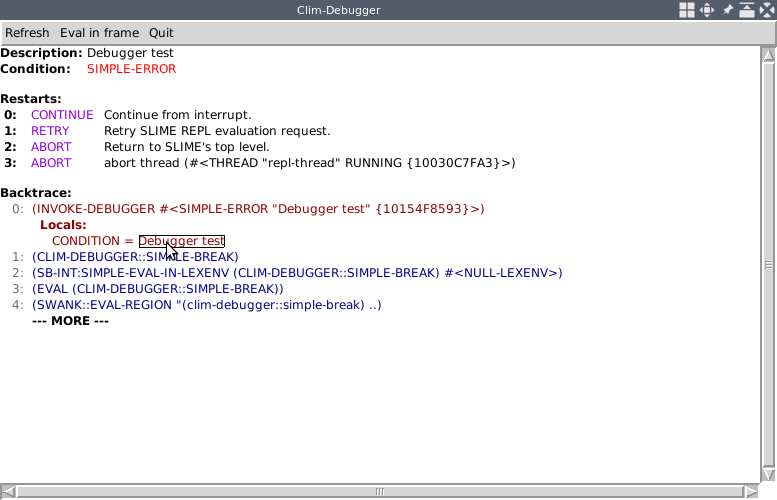 More work on the module is planned with a final goal to integrate it with the Listener and to have it as a default debugger for McCLIM applications. Suggestions on how to improve the interface, testing and help with coding are appreciated. Preliminary documentation has been written and put in the McCLIM manual draft. I've started working on a library called Slim the goal of which is to provide some of the CLIM interfaces in easy to learn and write manner (i.e more context dependent, less verbose names, unified abstractions etc.). For now it is only a skeleton having barely four macros, but I'd love to hear suggestions, what should it contain, in what form etc. A sketch may be found in the source code Libraries/Slim/. If you think it is a bad idea to have such library shipped with McCLIM – let me know about that too! The documentation was extended in some places. Also building the info document works now (long standing issue). An updated version of manual draft may be found on the McCLIM website. The Drei documentation has been put in a separate document due to its size and independent scope from the rest of McCLIM. Nisar Ahmad has solved one of the bounties related to menus and command tables. He also submitted documentation for the menu functionality, thereby earning $150. Congratulations! Speaking of finances - all money is now accumulated solely for bounties and development tasks, none is withdrawn by me since the beginning of year 2017. Currently we have $1226 at our disposal and active bounties worth $700. Declared monthly donations at the moment equal $297. Additionally one-time contributions come every month. That means that we can post two or three bounties a month without draining the current resources, or spawn a bunch of worthwhile tasks and keep going as money comes. This is fantastic news. Thank you all for your support to the project! New bounties have a time limit assigned to them (six months) – thanks to that we are able to reclaim money from unresolved issues and propose it somewhere else (or repost the same bounty). To improve the visibility of the issues which have bounties on them I've added a label to GitHub issue tracker: bounty. Suggestions as to which other issues should have a bounty on them are appreciated and welcome. Please note that Bountysource has a functionality "Suggest an Issue" which may be found on the bounties page. If you feel that you may solve some problem, but there is no bounty on it, feel free to suggest it too. We are very happy that the number of McCLIM users grows, which may be infered from number of questions on the IRC channel, bug reports and pull requests.